The Haute Route is the highest and toughest of the trails which follow the Pyreneean mountains on the Spanish/French border from the Atlantic to the Mediterranean. It involves navigation of 800km+ often unmarked, rough trail and 42,000m of ascent. I’d be going solo, bivvying, and carrying all of my stuff (up to 8 days food). For the extra challenge, I only had 31 days in order to get back to Leeds in time for my graduation. It was going to be incredible! I was going to have an amazing mountain experience, be living the dream, then come back a true mountain goat with legs of steel ready to finish off the fell running season with a bang for the rest of the summer. I was even fundraising for the Jack Bloor Fund, which I was super excited about as it felt great to be giving back to an organisation which was supporting my trip and so many other young people. I promoted it on social media, and was overwhelmed by the support I had within just a few days. Day One was forecast for torrential rain the entire day. I set off in good spirits regardless, ecstatic to be on Day One of my trip and knowing the forecast was meant to improve each day. 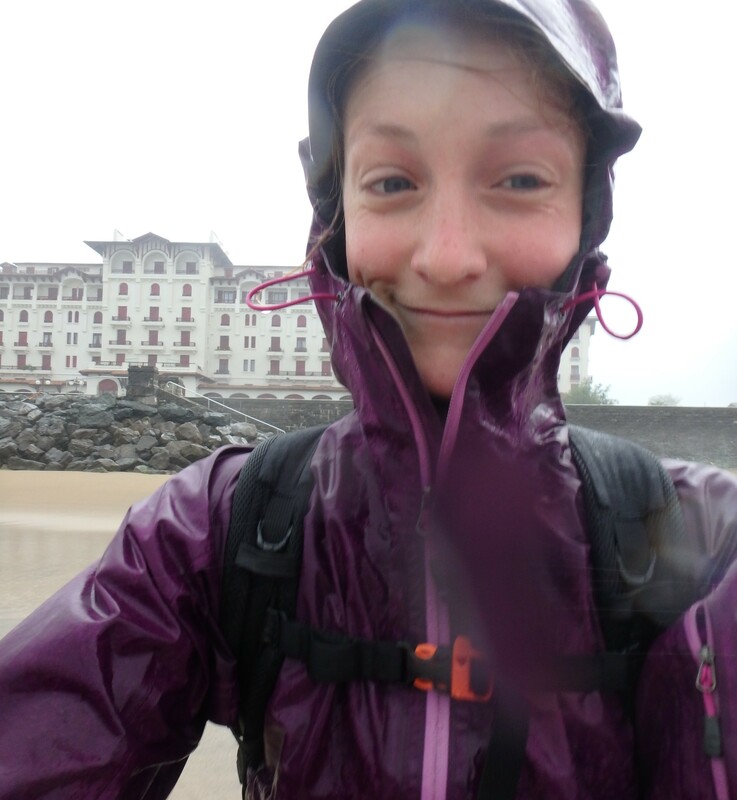 I ran around Hendaye in the pouring rain trying to find camping gas, soaked within minutes. After 4hrs of searching and no gas to be found, I set off without, hoping to get some on the way or to rehydrate my couscous with cold water. My pack felt ridiculously heavy. I’d done a month’s running trip with almost exactly the same kit a year before in New Zealand, but this year my training hadn’t been good. I’d been running well a few months before, but had been limited to the roads around Leeds due to final year exams and exam-season flu – no big mountain days. I’d been exhausted and run down for a month, and as a consequence had done nothing more than short jogs during the few weeks before in an attempt to get my energy back. A few days before leaving I finally felt like I was back to my ‘normal’ self, but I definitely wasn’t physically prepared. By this point there was nothing I could do other than hope that my body would adapt as I went – something which is possible on a long trip. Moving on from the lack of camping gas, things continued to just not be in my favour. It was like my guardian angel had gone on holiday and been replaced by an evil wizard. In the torrential rain and mist I took a turning which gradually sent me back around the hill I’d just been over, so I ended up back where I started – wasting another 2hrs. A frustrating error for someone with many years of navigational skills! My map disintegrated. Over the next week it continued to rain, and there was still no gas – so I was limited to tortilla wraps and pâté/Nutella, packets of Uncle Ben’s semi-cooked rice (they are designed to cook the last bit in the microwave), and cold sardines. Every day the forecast said the weather would improve, and every day it didn’t. There were five days of mist, making navigation difficult – after spending hours lost on a hillside trying to find the road, I realised I was just metres away but the mist had been too thick to see it. After this, I followed roads round the hills where possible as the Haute Route isn’t a marked trail, and often only follows faint paths or none at all, so was pretty impossible in bad visibility. This meant long days on hard tarmac in my worn-out trail shoes. It was too cold to stop for long, and my legs were cold all day from the rain, warming up once per night around 3am when the warmth finally made it down to my toes. It was hard to stay positive through days of just me in the mist, with the only company the endless cows just out of sight with their clanging bells, and every person I met didn’t speak English. 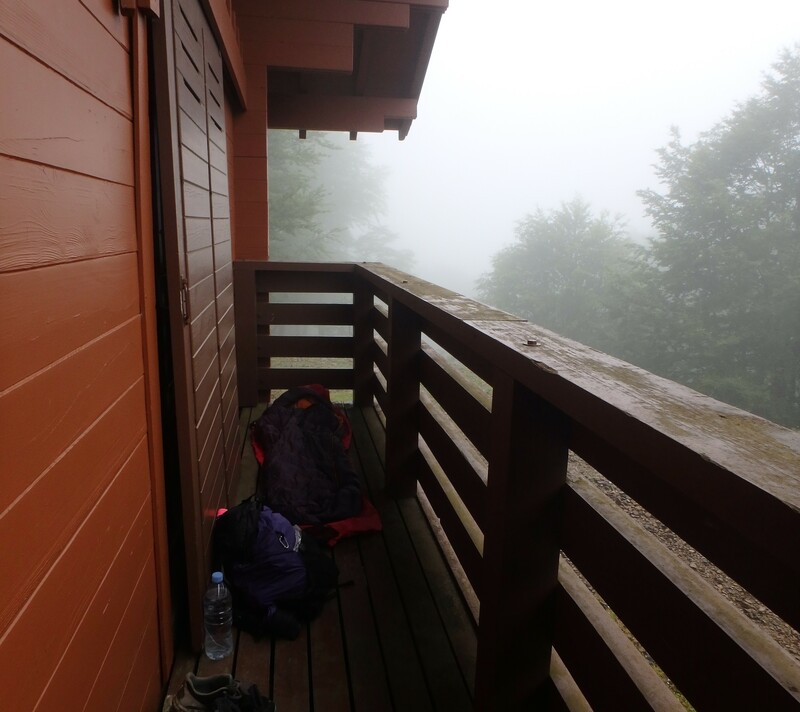 I felt rude and ignorant for not being able to speak either French or Spanish, and it made the mist even more lonely – something I had been entirely unprepared for as I’ve never felt lonely in mountains before. Everything hurt but usually, I’d wake up the next day to realise the aches had moved to a different place. I was adapting, and within a few days it felt more natural carrying a pack. So, when my feet/ankles started really hurting I presumed (hoped) it was another ache that would move on or disappear. But this didn’t happen and within just 5 days I had to have a rest day. My right ankle was double the size, with my left also very painful, with the tendons making creaking sounds when I moved it. I emailed Jim Davies (sports therapist and legendary fell runner) for advice and he warned it didn’t sound good, and I may need some ‘serious rest’. Where I’d stopped was a soul-destroying-ly miserable Col where the guy running the café hadn’t seen the sun since November. It wasn’t a good place to be, so I decided to set off slowly again, doing very short days, My feet had improved with one rest day - perhaps there was hope? For the next day, the forecast said sunshine ALL DAY, even for the top of the first ‘mountain-peak’ of the trip! But, it rained and was misty – again, all day, the forecast was wrong. By the end of the day I was barely walking and knew I wouldn’t be able to make it. Both ankles were very sore and swollen, and my right knee now hurt too. I was devastated and couldn’t believe after all the planning and support from everyone I had only managed 6 days and wouldn’t complete the trip. I limped down to the nearest village the next day and hitched out – and that was the end of my attempt. I had failed. I’m not a big cryer, but there were a fair amount of tears on this trip. However once I’d pulled myself out of this moping, perhaps a little self-absorbed, white-middle-class adventure-didn’t-go-to plan hole, I realised I wouldn’t change a thing. What is an adventure if not something with a solid chance of failure? It was a hugely valuable experience and taught me a lot. Practical ‘reminders’ like the importance of keeping the legs warm when running, not under-estimating the importance of good shoes, and having enough food. Also, more important things like making an effort to learn some of the language in a foreign country, training properly and changing plan if not, and taking a book. Most importantly, being grateful for the fact that I have a life that allows me to dream up, then simply ‘go for’ such random, wonderful adventures. Almost everyone I met said the same thing ‘You’re travelling alone, in the mountains? You’re so brave’. I tried as hard as I could to appreciate these comments - but really, what a load of rubbish?! I have a stable life, supportive family and friends, nothing life-changingly bad has ever happened to me, I have the luxury of time and the means to save money for this amazing trip. Pretty easy life really - pretty easy to be ‘brave’. I was lucky enough to experience some incredible moments which I can remember so vividly – made even better by the fact that the rest of the time it was a misty blur! A huge eagle swooped across the road out of the mist ahead of me, visible for just seconds but so close – it had clearly not heard me as the mist made everything so silent. Another time two shepherds dogs sprinted barking out of the mist – I was worried in case they were vicious guard dogs, but they were so lovely and I stood stroking them for a while – appreciating that language barriers didn’t exist with dogs! They then walked with me along the track as I tried to find the tiny path which took me down to the stream. In the end, they were the only reason I found my way - the point they kept pausing at by the track as we walked backwards and forwards marked the start of the path, and when I turned down it they went ahead, leading me for half an hour down the steep, rough hillside to the bridge – a ‘path’ which would have been almost impossible to find on my own. It took almost 3 weeks to recover - luckily some old family friends let me stay at their house in the Pyrenees so I spent time with them, helping out with their gardening work, cycling and swimming. It was great to spend time in their beautiful small French village, and at the end of it I was fit enough to do a 5 day trip in the high-mountains – in good weather, finally! Most of the trip was over 2000m, with the first day climbing up to Pic D’Estats at 3143m which was the best mountain day I’ve had in my life, and I had the top completely to myself. Lots of big rocky mountains, snow and beautiful lakes. I love mountains, the feeling space all around and the effect this has on sounds, the air - of being above anything. I love being able to use my own body to power myself through and over them, and the simplicity of life with just a small backpack. The rhythmic nature of running, in time with the breath, of floating over the trails up to the ridges and peaks. Of rising and sleeping with the cycle of the sun. Of feeling like you're moving, living and breathing as part of the wind, weather and ecological community we seem to be intent of removing ourselves from. ‘Being in touch with nature’ (although an overused and annoying phrase) reminds us that our bubble-wrapped world, with highly controlled temperature and light, and over monitored and scheduled lives, is pretty damn ridiculous. We shouldn’t be the ‘right’ temperature, mood, shape, level of rested, level of ‘pushed’, all of the time. We shouldn’t be continuously comfortable. Learning and development only ever happens when you push what you can do, and step to the edge of your comfort zone. Who cares if this didn’t go to plan? That’s where the magic lies, and I will be back. Follow Rosie on Instagram for adventure pics, and Twitter for all things environmental.